While women may view morality and crime differently than men, their views, processes, and contributions to the legal system are not inferior to what men offer, says Laurel Hermanson. Any time you ever get a group of women together, it’s never a good thing. When you’re dealing with all kinds of personalities in there and women with their emotions—they’re coming from all different aspects of life. — Susan Constantine, jury consultant in Orlando, Fla. The trial of George Zimmerman began on Monday and is expected to last two to four weeks. Zimmerman is accused of second-degree murder in the shooting death of Trayvon Martin last year in Florida. 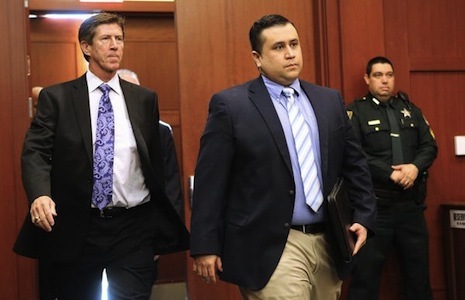 Zimmerman claims he was defending himself when he fatally shot the unarmed black teenager during an altercation. What began as a racially-charged and well-publicized debate took an unexpected turn last week with the news that six women have been selected to decide Zimmerman’s fate. Media focus has shifted to sensationalist headlines, as well as analyses of whether a jury comprising five white women and one Hispanic woman will deliver a fair verdict. When high-profile cases go to trial, jury composition is always scrutinized—O.J. Simpson’s 1994 trial for the murder of Nicole Brown Simpson, Casey Anthony’s 2011 trial for the murder of her daughter Caylee—but that scrutiny tends to include race and socioeconomic status as well as gender. Since the Constitution guarantees defendants the right to trial by a jury of their peers, evaluating the selection processes and end results makes sense. Yet this case feels different. Five of the six women have children. Six women. Five mothers. One atypical criminal case. The fact that Zimmerman killed Martin is not in question. Rather, these six jurors will decide if the killing was justified as an act of self-defense. Their understanding of the appropriate use of deadly force, against an unarmed teen, will be paramount. Consider a brief history of gender-based jury discrimination: In 1879, the U.S. Supreme Court upheld states’ rights to constitutionally exclude women from juries. By 1927, 19 states allowed women to serve. And by 1940, 20 years after the women’s suffrage amendment, only 29 states allowed female jurors. Not until 1975—yes, 1975—did the U.S. Supreme Court decide the case of Taylor v. Louisiana, wherein they denied all states’ rights to exclude women from juries. Some analysis is warranted, but not all is constructive. At best, these experts try to predict a verdict based on how women are likely to react to details of the case. At worst, they perpetuate the stereotype that women are too emotional, and incapable of getting along. The quote at the top of the page from Susan Constantine, which appeared in Sloane’s piece, is a perfect example of the latter. Sloane implied that Constantine was joking. Even so, is it still OK to joke that women can’t be trusted in positions of power because they are too emotional? Aren’t we tired of the trope that a roomful of grown women will end up arguing? What’s more, this line of thinking suggests that men don’t suffer unruly emotions, that they are less quarrelsome than women. And because of those manly qualities, they must be better suited to jury duty or other important roles. He was quoting part of a recorded conversation between Zimmerman and a police dispatcher. To me, this seems like a fairly strong but reasonable opening. Yet every article I’ve read mentions how the profanity appeared to “stun” the six female jurors. I can’t remember the last time I was stunned by even the foulest vulgarity. In fact, the women I know swear more often and more creatively than most of my male friends. We are not fragile flowers who wilt in the presence of strong language. Nor are women so delicate that they can’t withstand the pressures of a murder trial. Remember, five of the six female jurors have kids. We’ve been through childbirth, motherfuckers. Regardless of what kind of feminism one subscribes to—the belief that there are no inherent differences between the sexes and that gender roles are due to social conditioning, or that there are important differences between the sexes that should be valued—we can agree on one basic premise. While women may view morality and crime differently than men, their views and processes and contributions to the legal system are not inferior to what men offer. The Zimmerman verdict should depend on whether the prosecution presents a convincing case. The jurors are not defined by gender alone. They are complex individuals who have been shaped by their life experiences. I hope they become emotional. I hope they argue. Not because they are women, but because they have a daunting task ahead of them. If I were the defendant, I would expect nothing less. Role/Reboot contributor Laurel Hermanson is a freelance writer and editor in Portland, OR. Her first novel, Soft Landing, was published in 2009. She is currently working on her second novel, Mommune. She blogs about almost everything at Grace Under Pressure. Find her on Facebook and Twitter.